The curtains came down on another successful Bounty Farm Ltd Handicap Squash Tournament which was organized by the Guyana Squash Association (GSA) in collaboration with its corporate sponsor Digicel at the Georgetown Club Inc. courts with a spectacular display of exciting and attacking squash with amazing retrieving abilities demonstrated by the finalists in the Open category. 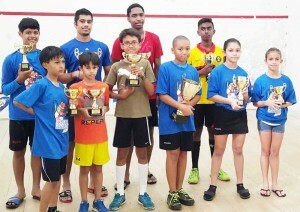 The respective winners of the Bounty Farm Handicap Squash tournament display their trophies. Jason Ray Khalil (-25) showed true class when he clawed his way back from match ball down to successfully defend his title in the final against national champion Nyron Joseph (-20). Nyron won the first game 15 – 11, but Jason bounced back to take the second game at the identical score 15 – 11. Spectators realized that they were in for a treat as the match had been going on for more than an hour. In the final game each player would have their runs as one player would win about four points in a row then the other player would do the same thing. At 14 – 11 match ball to Nyron it seemed as if Jason’s reign as champion would come to an end but Jason never gave up as he won the next three points to set up sudden death at 14 all. The final point seemed to go on forever but finally Jason played a boast for which Nyron had no answer and with that Jason closed out the game and match 15 – 14. Samuel Ince-Carvahal (-8), grandson of National Coach Carl Ince proved that he has what it takes to develop into an outstanding player when he defeated Ethan Jonas (-3) in the final of category A 15 – 10, 15 – 12. In the play off for third place in category A Demetrius DeAbreu (0) defeated Gianni Carpenter (-6) in three hard fought games. Scores were 15 – 6, 12 – 15, 15 – 9. Daniel Islam (+7) proved that he has improved immensely when he outplayed Alex Cheeks (+7) to win the Open category Plate. Daniel won the first game 15 – 11, but Alex bounced back to take the second game 15 – 9. Winning this game seemed to take its toll on Alex as he easily succumbed in the third 15 – 2. In the category A plate final Aliyah Persaud (+7) showed that she has also improved tremendously when she defeated Michael Alphonso (0) 15 – 11, 10 – 15, 15 – 10. Results of other matches played were as follows. Final results in the respective categories were as follows.